This pellet cutting machine has superior performance and reasonable structure. The sealing performance of the whole machine is better, e less leakage ,and It is convenient to adjust the cutting distance. the rotary cutter is made by hard alloy hob, it’s wear resistance is extremely high, the whole machine without gear design, effectively reduces the machine noise with the belt rotation. and the independent electrical box is Convenient, safe and beautiful. Cold-drawn pelletizing for various high-yield, high-strength engineering plastics. 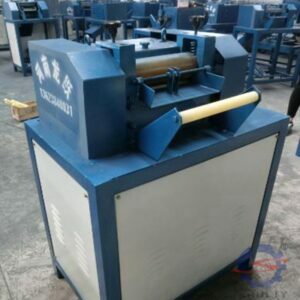 Plastic cutting machine, suitable for plastic blending granulation, pelletizing after extrusion stripping, suitable for pelletizing plastics such as nylon, polyethylene, ABS, polypropylene, etc. It is an accessory product of granulator and extruder. It is widely used in the cutting of various plastic cold-drawn strips. It is suitable for PC, PA, PP, PVC, POM.PET nylon, polyethylene, ABS, polypropylene and other plastics. Low noise and no spattering of pellets. All transmission gears of this machine are driven by involute helical gears. The gear materials are made of high-quality steel, so the transmission is stable, the noise is low, the transmission coincidence coefficient, the bearing capacity is strong, and the service life is long. The machine adopts high-quality integral cutters with sharp and wear-resistant, easy installation and uniform and full cutting particles. 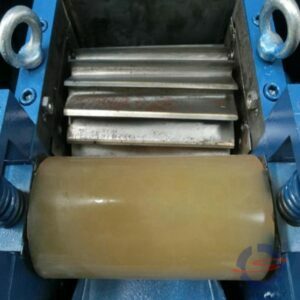 Constant pressure traction brace, special wear-resistant polyurethane rubber roller, manual spring adjustment, traction to ensure the plastic shape of various plastic products. 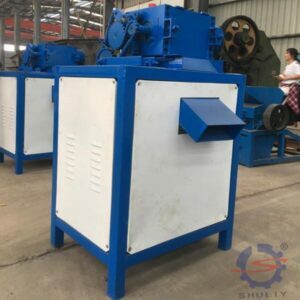 The machine is exquisite and beautiful, the structure is reasonable, the service life is long, the economy is practical, the pelletizing is uniform, the installation is convenient, and the price is economical.